This week is Valentine’s Day so of course I have been digging deep through Pinterest for ideas on different treats, outfits, date ideas, etc. Although my husband and I are apart this year for the 14th, it’s still fun to plan for next year. I decided to “roundup” a very short list of my favorite ideas I found and share them you! Disclaimer: I did not come up with any of these ideas. Going out for Valentine’s Day? Add a pop of red or pink to really get into the festivities. This outift I thought was SUPER cute. The great thing about this outfit is the sweater is perfect for the freezing temperatures. Shoutout to TopShop for getting me in the February 14th mood! Click for link to this outfit here. I got this idea from the This Momma Loves page on Pinterest. Here is a link to the recipe on her page. I have actually made this before, and it was so easy and delcious! It is a perfect mix of both salty and sweet, and it is easy to bag up and give to friends and family as a little treat. 10/10 would reccomend! Okay, so this might take some convincing of your SO, but ‘Isn’t It Romanic’ with Rebel Wilson come’s out the 13th, which is just in time for Valentine’s Day. My husband dodged a bullet with this one since we won’t be together this year, but my family is graciously taking me next weekend, and I cannot wait! It looks hilarious and romantic which would make for a perfect date night. Why spend money out when your date night can continue at home? 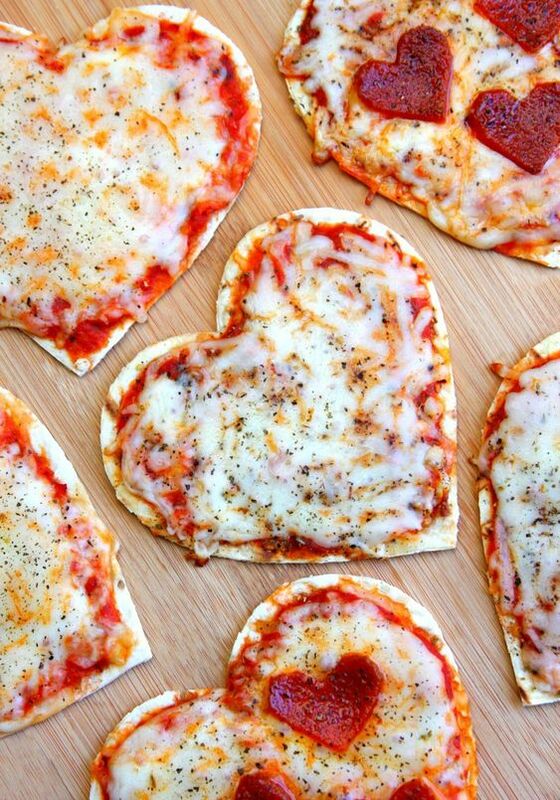 My husband and I LOVE making pizza, so this cute idea takes the win for a Valentine’s Day dinner. Super easy and fun, you both will be talking about this until next Valentine’s Day. Here is a link to a recipe by Happy Go Lucky Blog that looks incredible! Also creds to them for the pic. I will definently be trying this soon. Who says this has to be limited to Valentine’s Day? Love gives the excuse to treat everyday like Febuary 14th. I have a lot more ideas on my Pinterest so click the link below for more decoration, food, and outift ideas for this week. Also make sure to follow my blog for future posts. Let me know in the comments below how you celebrate Valentine’s Day! CLICK HERE FOR MORE V-DAY IDEAS!